The HEARD team are home from the XIX International AIDS Conference in Washington and hopefully are reflecting on what we did and learnt. I am currently in the UK, and was in DC the longest (from Wednesday 18th to Saturday 28th July). This was my last official meeting as Treasurer and Governing Council Member of the International AIDS Society (IAS). On Saturday 21st July we had a breakfast Finance Sub-committee meeting at the absurd hour of seven thirty am, followed by the Executive and Council Meetings (until three pm). The IAS members’ meeting was the following week. I completed my duties as Treasurer by presenting the 2011 Financial Report. I have learnt a number of lessons attending conferences over the years. The paramount order of business is to get a suitable room at the hotel. The one I spent the first night in faced a busy street and was very noisy, with buses stopping outside from about four o’clock. I spoke to the receptionist and spent an hour the next day looking at rooms before identifying the one that I would call home for the next nine nights. I do not for example; want a room with two king-size beds, I only use one at a time. I walked around the hotel with the concierge, a thick set Liberian gentleman called Shakespeare. He let me into rooms until we identified the best option. I did not in fact make him carry the luggage but he did not seem to appreciate this. I ended up on the seventh floor. It was fortunate that we were at the conference all day because the hotel was being renovated. The work was going on immediately above me, drills and jackhammers from nine o’clock to five o’clock, sleeping during the day would have been impossible. A second lesson is that airlines do not look after your luggage! When I last went to South Africa, the handle of my case was destroyed. I only remembered that I needed a new one towards the end of my stay in Durban. I dashed to the luggage shop and chose what I thought would be a sturdy case. Arriving back in Norwich I discovered it was missing a wheel and I had a fairly bad tempered exchange with Linda, one of the grounds staff in Norwich. The bag has since been collected and company will decide whether to replace it or repair it. Packing for the Washington trip was not a problem because we have plenty of cases in the house in Norwich. However the return connection from Washington via Amsterdam to Norwich was tight and we were further delayed due to thunderstorms. My bag was not on the carousel at the airport, but I kind of expected this. The person on duty was, unfortunately, Linda. It is rather alarming that I had made enough of a (bad) impression on her that she knew my name, although not my title! As I had anticipated the bag came in on the next flight and was delivered to the house. I attended bits of two pre-conferences. The first on Social and Political Sciences, where I presented Thinking Politically …With a Focus on the Politics of AIDS Exceptionalism vs. Taking AIDS out of Isolation: Reflections from South Africa, it was surprisingly painful to put this talk together as it brought back the dark days of denialism. The second was the International AIDS Economics Network (IAEN) pre-conference. HEARD was one of the co-sponsors and organisers of this meeting. It is always a pleasure to be surrounded by other economists as it makes one feel ‘normal’. Another spiritual event was the special AIDS service at the Washington National Cathedral, a magnificent mock gothic building. Every faith, sexual orientation and gender was represented (except I think for the scientologists). 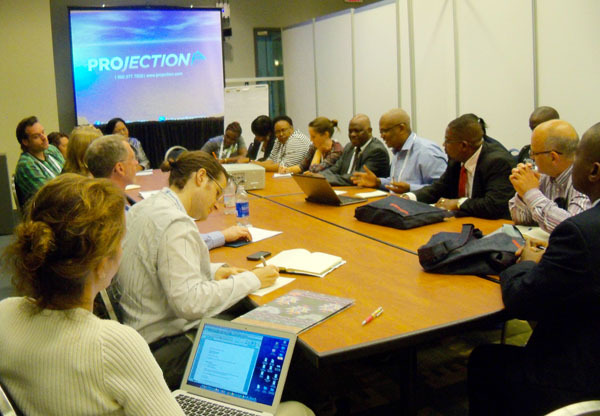 There were numerous presentations and meetings at the International AIDS Conference. Of particular interest was a ‘round table’ event organised by the International AIDS Alliance at the British Embassy on the importance of human rights approaches to HIV and AIDS. My conference highlight was facilitating Swazi special interest meetings, held in the IAS offices. We had no idea how many people would turn up: it was billed as an opportunity to hear what was going on in Swaziland for people who work in, do research on, or simply care about the country. To our surprise and delight the room was full for both meetings. It saw the birth of the Swaziland AIDS Research Network (SARN). Unfortunately I was not able to attend the second meeting because I was chairing the rapporteur session (which I did in Vienna in 2010). This is the last formal assembly of the conference before the closing ceremonies. A key attribute required of the Chair is they be able to keep people to time. I can and did. I even made a few jokes. It was fun. As I was also present at the meeting as a DFID Senior Research Fellow I had the opportunity to work with my colleagues from London and South Africa. This was a real learning experience as they produced both a ‘Telegram’ and an excellent ‘Back to Office’ Report. I am lifting from my contribution to the report for my reflections on the meeting. There were two major tensions. First biomedical science now rules. There was little discussion of behaviour change. Second participants heard much about the cost of response and what the funding gap is, but there was no reality check on how the gap might be filled and what to do if it is not. The central theme was moving to ‘an AIDS free generation’. I understand this to mean everyone who needs it is on treatment (thus people living with AIDS, but not dying from the disease) and there be zero new infections. One quick and obvious win will be to eliminate mother to child transmission. Mead Over of the Centre for Global Development has consistently pointed to the concept of an ‘AIDS Transition’ where the number of new infections falls below the number of AIDS deaths. Until this happens the number of people living with HIV and AIDS will increase (as will the need for resources). Much has been written about the Conference. I can especially recommend the blog of Laurie Garrett of the Council for Foreign Relations in New York. In summary it was worthwhile and fun. The fact that the IAS has been able to bring the conference back to the US (due to the lifting of the travel ban for HIV positive people) was mentioned frequently, and is significant. This was the conference where economists should have stepped forward but did not. Hopefully they will be present, vocal and listened to in Melbourne the site of the XXIAC in 2014. My prediction is that Melbourne is the conference where behavioural science should be prominent and probably won’t. Despite this I do have a sense that we are beginning to win the battle against the epidemic. The challenges will be, as always, to prevent new infections; treat people already infected; and provide for those who are impacted, the orphans, the elderly, and address the needs of the health care services. At the end of the conference there is always a party for the IAS staff, volunteers and Governing Council Members. It started at about eight o’clock and finished at one o’clock the next morning. Generally these are great fun and this was no exception although I was a little taken aback when my neck was nuzzled by an unshaven male. Clearly I was sending a wrong message. This posting would not be complete without mention of the Olympic Games which are going on in London. It very much reminds me of the mood we experienced in South Africa at the time of the Soccer World Cup. A major sporting event, it is an opportunity to have a party, and unite in supporting one’s own teams, while making all the visitors feel comfortable and welcome. Britain had not done all that well in terms of winning medals at the time of writing but there is time. On Wednesday I saw two women win the first British gold medal for rowing. Cyclist Bradley Wiggens (who had just won the Tour de France) took gold in the final trials, an amazing achievement. The speed at which they ride is a dangerous 50kph. All the venues are great, and because they are spread out across London and the South East there is a sense that it is more than just one city hosting the games. The train from Norwich to London goes past the Olympic site and I have watched with interest as the building began and was completed. I do hope that this provides a sporting legacy for the country. Peter Piot, No time to lose: a life in pursuit of deadly viruses, WW Norton & Company, New York 2012, 387 pages. This autobiography tracks the progress of the HIV epidemic since its earliest days. Peter was the head of UNAIDS from its inception to 2008 – a total of 12 years. This is his story, from the early adventures in Zaire where he was part of the team engaged in the identification of Ebola virus, through to his stepping down from the executive directorship of UNAIDS. It is a fascinating book and an easy read. I took it to my gym and found myself losing track of time. Any book that does this for me has to be excellent. It is particularly engaging since I both know the history and was a part of it. Having finished the book and reflected on it I feel that it is a factual account of what went on and Peter could have put more of his personal story into it. There are gaps, for example the Commission on HIV/AIDS and Governance in Africa, set up by Kofi Annan is not mentioned. I was a member of this, which may be why I wanted to see it cited. The last 50 pages appear to have been written in a rush. Nonetheless this book is an important chronicle of the time of AIDS and deserves to be widely read. One thing that is clear is that we were all ‘making it up as we went along’, there is no way we could have done anything but this. Peter’s comments on the origin of the denialism in South Africa show how bizarre this period was. “Mbeki was an intelligent, indeed coldly rational man; and yet here he was impervious to my reason. What could be the origin of this denialism? I had thought maybe it was economic – the cost of treatment – but after that evening I was convinced that this could not be the case. Psychological, then. …”. Page 280. Andrea Camilleri, The Track of Sand, Picador, London, 2011, 279 pages. This is one of a series of books featuring Inspector Montalbano, a Sicilian detective. As always when reading a book that has been translated from a different language I wonder how important the original style of writing was and how important the translation is. The Scandinavian crime writers are a good example of this as they are extremely popular and include Swedish, Norwegian, Danish, and even Icelandic genres. This Montalbano series of books is great fun. It gives a sense of the complex society of Sicily and the characters are kindly portrayed. There is an awful lot of food and a little bit of love in the stories. This particular mystery centres on the body of a horse which appears in front of the inspector’s apartment. It is whisked away while he is trying to get his men to come and assist with the investigation. The story takes off from there and, pardon the pun, gallops to a thrilling end. I recommend these as something more than a light read. The Best Exotic Marigold Hotel a 2012 British film directed by John Madden. It has a starring cast of older actors Judi Dench, Bill Nighy, Maggie Smith and Tom Wilkinson are the ones I recognised. It is about British pensioners moving to a retirement hotel in India, run by an eager young Indian entrepreneur. He sells the Best Exotic Marigold Hotel, in Jaipur as a hotel “for the elderly and beautiful”. There are a series of stories: an impoverished widow; a gay High Court judge who grew up in India, and who is seeking his first love; a working class racist, retired housekeeper who needs a hip replacement operation (quicker and cheaper in India); and a couple of love stories. The acting was outstanding, the story plausible, and I really enjoyed the fact that I have spent time in Jaipur and so recognised the setting. Salmon Fishing in the Yemen a 2011 British romantic comedy-drama film. This is the story of a sheikh who decides to introduce salmon into the Yemen as part of a ‘civilising’ and economic development process. His consultant asks the British government for help and the press secretary decides that this is a good news story and a time of really bad news from Afghanistan. The main character is the Scottish expert in salmon fishing who also has mild Asperger’s syndrome: “You can’t insult me because I don’t understand it.” It is also a love story and there are probably many metaphors in it. It has the potential to become a cult film. I am pleased to note that it has been a box office success. The Internet chat between the press secretary and the Prime Minister is beautifully captured on the screen and in the story. The Girl with the Dragon Tattoo a 2011 American made thriller. This is the first of what, I hope, will be a trilogy of films since there were three books. It is based on the Swedish novel by Stieg Larsson and stars Daniel Craig and Rooney Mara. It is the story of journalist Mikael Blomqvist’s (Craig) commission for a wealthy Swede to find out what happened to his niece who disappeared 40 years earlier. The film builds and then introduces computer hacker Lisbeth Salander (Mara), who is the ‘Research Assistant’ and while being extremely capable on computers is gauche and uncomfortable with people. There are some violent and distasteful scenes, and it does not end happily for all the characters. I had been hoping to watch it for some time. The flight from Washington to Amsterdam is about seven hours and this film is nearly three hours long. Given that I was in economy class (well premium economy) I decided this was the chance I had been waiting for, although, frustratingly it took over an hour for my seat’s entertainment system to start working, it was reset about three times. An excellent series of books and the first film in series is fantastic; I will look forward to the rest. This entry was posted in Blog and tagged AIDS, International AIDS Conference, International AIDS Society, Norwich, South Africa, Washington, Washington DC, Washington National Cathedral. Bookmark the permalink.